Sozopol is perhaps the oldest town on Bulgaria’s Black Sea coast – an ancient seaside citadel, which today attracts both domestic and foreign tourists alike. Sozopol is easily reached from the airports at Burgas, and it makes the perfect destination for anyone looking to combine some rich culture with their holiday of sun, sea and sand! When it comes to transport in Sozopol, be sure to make AroundBulgaria your first choice. We’ve got a range of Sozopol taxi services on offer, while our extensive local knowledge will allow us to help you get the very most out of your holiday to Bulgaria. Wherever you need to go in Bulgaria, our taxi service will be able to get you there with speed and precision – not to mention at some of the best rates you’ll find. We can adapt our service to suit your needs… no matter whether you’re planning a business meeting, or a shopping trip! You can request a taxi service from us at any time of night or day, thanks to our convenient 24/7 booking system. Whatever your vehicle needs, we’ve got you covered – with a range of cars, minibuses and SUVs on offer. Our services come with complimentary insurance coverage for all of our passengers! Brought your skis with you? Or maybe you’re carrying a surfboard! We’ve got plenty of space on our roof racks… plus we can even provide car seats for your younger travellers. You’ll find wireless Internet available in our vehicles, allowing you to catch up on emails during the journey. During the ride you’ll have access to the music player and air-conditioning, allowing you to set everything just the way you like it. All of our vehicles are smoke-free, and kept to a perfect standard of clean. Call AroundBulgaria today, and let us offer you an affordable quote on a taxi in Sozopol. We’ll be able to charge for a taxi according to distance, or even by time – we’re always keen to find the arrangement that works best for our customers. Once a price is agreed, it’s fixed in place. Here at AroundBulgaria, we’ll never charge you hidden fees later on. You’ll have nothing to pay initially, either – just make a payment to your driver, once you’ve arrived safely at where you need to go. And don’t worry if you haven’t had a chance to buy your Bulgarian Levs yet… we can take payments in a range of currencies, including US Dollars, Russian Rubles and Euros. If you’re booking more than one service with us, we’ll also be delighted to provide you with a healthy discount. Talk to our advisors now, and find out more about the exciting special offers open to our corporate, regular and returning customers! For any questions, or to get your own affordable quote on a taxi service in Sozopol, simply give the friendly team at Around Bulgaria a call today! We look forward to hearing from you. Other Local Taxi services: Taxi sozopol. 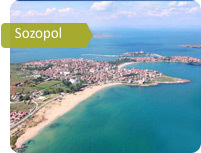 The unique resort town of Sozopol is located not far from Burgas. It was founded in ancient times, and was called Apollonia. Nowadays the town’s beauty is due to the exquisite mansions with tiled roofs, garden plots lined by climbing vines, parks and gardens. The unique resort recreation zones of Sozopol, with magnificent sand covered beaches attract a host of tourists each year. Ancient bronze objects were found in the bay by the town. These objects are the logo of Sozopol. In the surroundings tourists can enjoy unique natural landscapes, dense forests and bushes. Last year I decided to travel to Bulgaria with my granddaughter to have a vacation. My daughter recommended AroundBulgaria.com, and now I myself recommend it to all my friends. I arrived with the kid at Burgas Airport (and of course, we didn’t know how to reach Sozopol). It was fortunate that we booked a transfer in advance. We got out of the airport, it was an unfamiliar place, we were at a loss, but the driver was there, he took our baggage, took us to the car, and then drove us smoothly to the necessary spot. The man was a very amicable person, telling us what local sights are highlights, and offered us excursions; we readily said we were keen on excursions. I would like to express the company employees my deep gratitude for the memorable, interesting vacation. My granddaughter was fascinated after she toured so many places. I recommend AroundBulgaria.com to everybody.